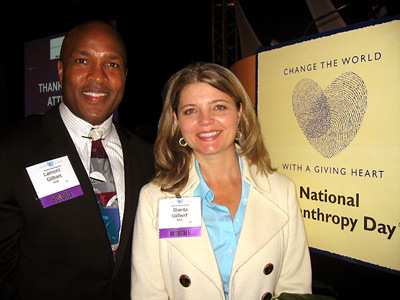 On November 19, 2008 at the 22nd Annual National Philanthropy Day awards luncheon in San Francisco, CA, Lamont & Sheila Gilbert received a commemorative award. It was stated that the award is recognition "for your creation and on-going commitment to the Nicholas Colby Fund® in loving memory of your son. By Helping Children Be Children® you have created thousands of lasting childhood memories that uplift the spirit of a child and bring smiles to the family of the child." Remember the inaugural Nicholas Colby Fund® Basketball Clinic with the Golden State Warriors held on April 7, 2008 wherein patients from Children's Hospital Oakland, Stanford-Lucile Packard Children's Hospital, and UCSF-Children's Hospital were treated like basketball stars? And they got to interact with Warriors' coaches and special interactions with basketball star Monta Ellis and Warriors mascot Thunder.